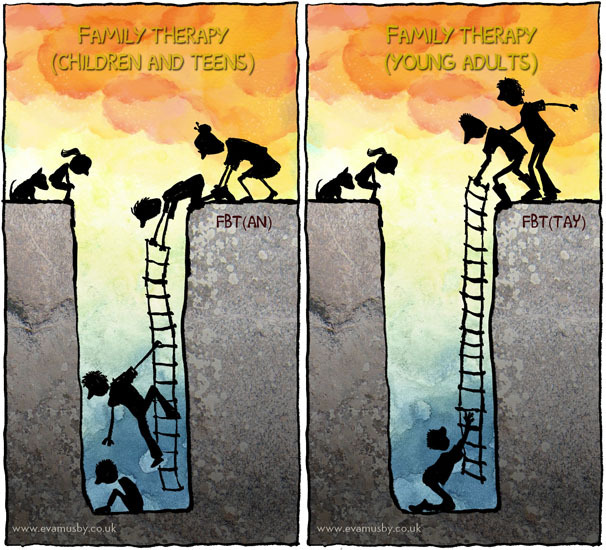 The creators of FBT (Lock, Le Grange and others) are trying out family therapy on young adults (17-25 years). They wrote this up in an expensive book and I'm keen to get parents and clinicians to know about it because the approach uses more buy-in (more teamwork) from your youngster. Brilliant article Eva. It makes for interesting reading. Everyone please note: There is a "Relapse Prevention Plan" embedded in this article, and it looks extremely useful. I think it is a step forward and can see no reason why this will not work with young adults. Thank you Eva, I too think this is very useful. I hope it will prompt health services to coordinate themselves to remove their sharp divides between adolescent and adult service, and to provide evidence-based approaches for all ages. Yes I totally agree. It is a very scary moment for the child/ young adult. The best they can hope for is that the parent realises 'my child is emotionally not at the adult stage' and not join in with this way of thinking ("You are an adult now; you should be more responsible"). Recovery never happened in one day. Hi Eva, very interesting article am a parent of 18 year old , we are fully preparing and supervising all meals she is showing no signs of taking over any independence of meals.Since discharge from ip in March she initially started to restrict it's been a struggle every day and still haven't gotten fully weight restored but things are a whole lot better she is 18 in a lot of aspects of her life but not where her eating is concerned and if she had taken over looking after her nutritional intake after discharge she would have been back ip in a few weeks. We are lucky that she allows me some involvement with therapist . I found this article very interesting as the parent of a recovered 18 yr old currently experiencing a 'blip'. The problem is that she was almost 18 and we stepped back from the feeding role. To her she has not dieted, but she 'doesn't like' certain foods or 'isn't hungry' or whatever, and over time she slowly fell back into old ways. to remind her of her needs. And I do think it was explained poorly to her that her weight would continue to go up and that she should be weighed (at least blind weighed) to ensure that she was on target with that. She thought she would never have to think about food or weight again. And she thought that her discharge weight was her ideal weight for the rest of her life. She came out of FBT alive, well, and WR, and for that we are eternally grateful. However, I think she needed more YA stuff about managing... not a chronic illness...but a life-long health challenge. It would be wonderful for clinicians to have the tools to work with YA's and almost YA's. Yes, education and plans around relapse prevention seem essential and it's good to see it on the FBT protocol for young adults (FBT-TAY). The standard FBT (tested on under-18s) does not spell this out, if I'm correct ( I'm conscious I don't have the latest editions of the FBT manual and parents' books), and if that's so then we are relying on the individual therapist's judgement. Every now and again I get a chance to chat with FBT experts and I will remember to try and discuss this with them. Much needs to be clarified with regard to transitioning from one program to another (adolescent to adult). Our dtr lost 10 pounds in 2 weeks, after going from FULL Meals support both in hospital and at home, to the new 'Transition program'. As far as I am concerned it was a failure. We, the parents knew she was not ready, but our opinion did not count, as from the moment she turned 18, they were 'transitioning' her out of the adolescent program, even though she was not ready. I do believe the clinicians/entire team need to respect the caregivers opinion. Our 'transition therapist', had an adult program approach. I feel this might have gone better if the transition therapist met with our dtr/parents/adolescent therapist in the adolescent program and discussed her prior progress and current level of meal support. Knowledge is power! In order to have successes with this age and program transition, you really need good communication with both therapists, the client and the family! Clear expectations need to be laid out for both our dtr and us as to what the consequences would be if she did not have adequate nutrition/full meal completion or had repeated weight losses while in the adult program. If we had taken over even after the first week, I feel ED would not have had an opportunity to get so strong and she would not have continued to loose so much weight! Now, she...and we are trying to climb our way back up! Having a program and a therapist for "Transition" sounds good, and how it has been executed in your case sounds not at all like "transition". How utterly frustrating. Ate a better lunch under my eye, hopefully can turn this around.